Via the blog, SupraGeography, written by Oliver O’Brien, a researcher and software developer at the Centre for Advanced Spatial Analysis (CASA), TheCityFix came across wheelmap.org. It’s a website (and iPhone app) built to display and aggregate information on wheelchair access in cities. 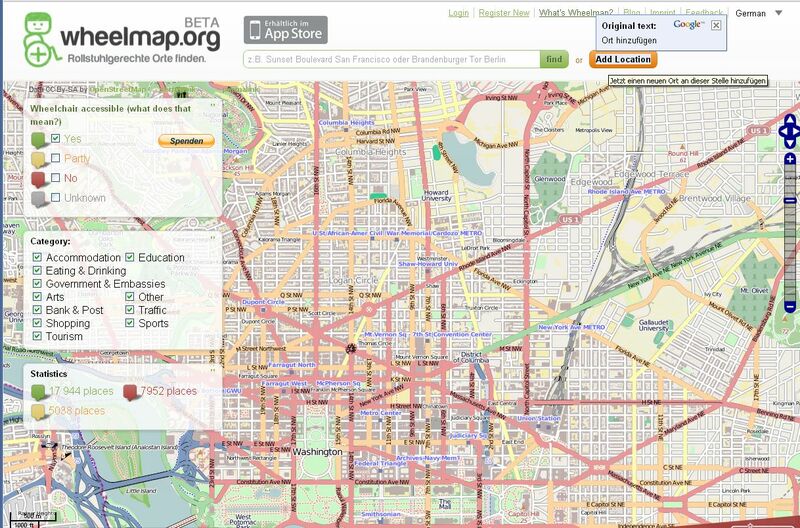 The site utilizes data from OpenStreetMap, but with a more specific purpose. OpenStreetMap is a site that allows users to “view, edit and use geographical data in a collaborative way from anywhere on Earth.” The maps also show land by usage (i.e. farm, park, forestland, residential area) and roadway (i.e. cycleway, motorway, subway). As you move around the map, an overlay highlights the [Points of Interest] POIs and colour-codes their accessibility for wheelchair users. Adding or changing the accessibility for a POI is as easy as clicking on it and clicking one of three options – job done! The data is then fed back to OpenStreetMap (so the whole community gets the benefit of this extra “tagging” information) and Wheelmap itself updates the colour. Another intention of the map design seems to be to encourage locations to become more wheelchair accessible. There’s something striking about viewing the map and seeing institutions, cultural sites and schools surrounded by streets, indicating where a person in a wheelchair can and cannot easily access.